The Breakdown: Why is Russ Feingold in Trouble? Chris Hayes and Wisconsin native John Nichols discuss the grave challenges facing the senator and how Obama and the state's economy affect Feingold's chances this fall. With recent polls showing Senator Russ Feingold (D-Wisconsin) trailing opponent Ron Johnson by as much as seven points, political junkies are scratching their heads, wondering why Feingold is in so much trouble. Mentioned as a possible 2008 Presidential candidate, Feingold has been a US Senator since 1993 and served on the state Senate for ten years before that. He is also known for his cosponsorship of the Bipartisan Campaign Reform Act and his stance as the only Senator to vote against the USA PATRIOT Act during its first vote. 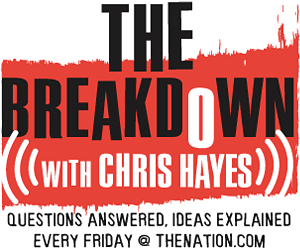 On this week’s edition of The Breakdown, DC Editor Chris Hayes and Washington correspondent and Wisconsin native John Nichols discuss the challenges facing Feingold and how Obama and Wisconsin’s economy affect his chances this fall. John Nichols’ article on Russ Feingold, The Senate’s True Maverick. Video of Feingold questioning Department of Justice officials on the PATRIOT ACT. A Rasmussen Report on Wisconsin’s Senate race.